Chimney lining is crucial to maintaining a safe home. The function of the chimney lining is to provide proper insulation and help prevent toxic gases in the chimney from entering your home. 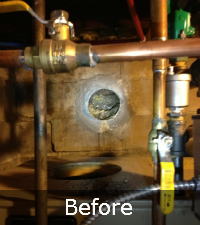 If the liner is not installed correctly or if it is damaged that could cause a puff back. A puff back is a large amount of harmful smoke entering the home. This is extremely dangerous. When looking to rebuild, repair or replace your chimney or chimney liner, it is important to first know what is required from a chimney lining specialist. At Sunrise Roofing and Chimney, our chimney lining specialist will come out to inspect your chimney to see what is required for the job. Proper insulation and installation is necessary to ensure safety and comfort. Sunrise Roofing and Chimney is a fully licensed and insured roofing and chimney contractor from Medford, NY. 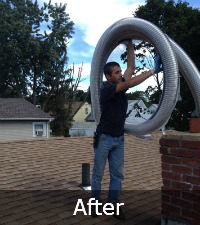 We have over 15 years of experience repairing and servicing chimneys on Long Island. Our Chimney lining services include installation and repair of chimney lining and replacement of chimney liners. What Does A Chimney Liner Do? A chimney liner essentially helps protect the house from fire. The chimney liner gets better draft from the furnace to work more efficiently. Chimney liner also stops the condensation and leaks from entering the foundation of the chimney. Do All Chimney’s Have A Chimney Liner? All Chimney Liners vary. Chimney liners are made of different material. Chimney’s made with terracotta brick or AsBest Chimney Pipes require chimney lining. 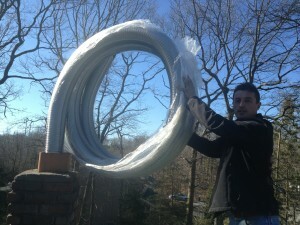 If the Chimney has Stainless steel or galvanized pipes, then your chimney will not need lining. How can I tell if I need a new Chimney Liner? You can tell if you need a new chimney liner if the terracotta starts to rot and crumble. 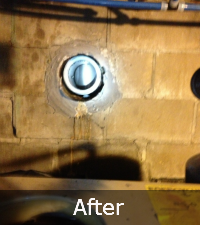 Most Chimney’s will start to leak in the foundation by the smoke pipe or by the clean out door. You will also see pieces of terracotta at the bottom of the chimney. Can Chimney Liners be repaired? Chimney liners need replacement depending on how the liner is made. It also depends on the size of the pipes as well as the height and position of the house. A Sunrise Roofing and Chimney contractor will come and evaluate your chimney and see if your chimney is in need of repair or replacement. Do I need a Chimney Liner in my chimney? A Chimney liner is highly recommended. The chimney liner helps to protect the house and the chimney from water leaks. Chimney lining is a great investment for your home. Chimney Liners help to save on oil and gas bills from your boiler. Are there different sized Chimney Liners? Depends on the size of the boiler and the size of the pipes that are connected to the same chimney. Depending on how many pipes will dictate the size of the liner that is needed. Will I see the Chimney Liner from my fireplace? You will see the chimney liner from your fireplace if you have an insert fireplace. Most chimney liners are not visible. The liner is inside the chimney. What is Chimney Liner made out of? Chimney liner is made out of stainless steel double wall. How can I tell if my chimney already has a Chimney Liner? You can tell if your chimney already has a chimney liner if you disconnect the smoke pipes and check inside the fleu. You can also inspect the chimney from the top. The chimney liner will be visible 3-4 inches on top. 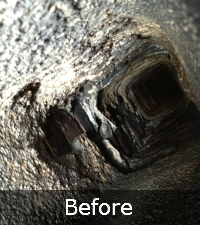 View our Before and After Chimney Lining Installation photos. If you need a chimney inspection we offer 100% free estimates. We will inspect your chimney and determine if you need new chimney lining. 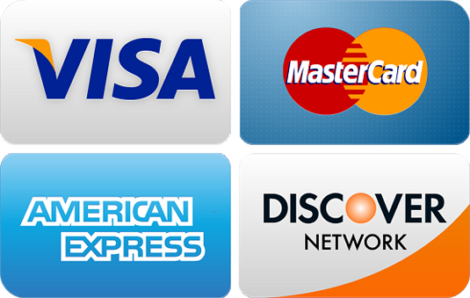 We’re so sure you’ll be satisfied with our satisfaction guarantee – up to 10 years on labor and 30 years on materials depending on the manufacturer. For more information on chimney lining services on Long Island, contact Sunrise Roofing and Chimney of Medford, NY at (631) 657-5059 today.